I've been on the lookout for Christian missionaries in Moldova. I have started finding some missionaries who are willing to share their experiences in Moldova (Republica Moldova) in their blogs. 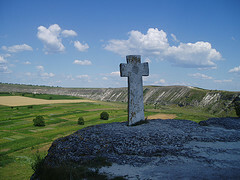 The tiny country of Moldova in Eastern Europe is rich in history and culture, being a key crossroads of other cultures. The culture is influenced by the Eastern Orthodox Church. Moldova is also one of the poorest countries in Europe, in spite of its beautiful farmlands. It has faced challenges such as poverty, human rights concerns, and orphans needing care. Because of constant changes and movement, I don't have as many bloggers on this page as I have in the past. So please - if you're a missionary in Moldova, contact me so that I can add your blog! For now, I would like to present the Gross Family to Moldova. This is a brand new blog - started in 2012! The family is serving in a central area of the country (though as I write they are planning to move north). The website includes more than just the blog - newsletters, information on Moldova, and even newsletters. In the past I've written about Barb in Moldova. Well, Barb is no longer in Moldova, but she has left her blog up for the time being. So you can learn more about the country and the needs of the people there. The official language of Moldova is Moldovan, which is very close to Romanian. The Moldovan people are very literate. Life expectancy is just over 70 years. Football and rugby are very popular in Moldova. A huge challenge in Moldova is unemployment and alcoholism. Training and discipleship are huge needs. Ministry materials are in low supply, so that can be a challenge for missionaries working in the country. Short term ministry also seems to be increasingly popular in Moldova, so these groups can use your prayers along with the long term missionaries.